You live capoeira. You breathe capoeira. Is it really any surprise, then, that you dream capoeira as well? Or do you? Dreams are often based on pieces of information we are most preoccupied with at the time, or on fragments of our days, or on hidden yet strong and influencing notions or worries in our subconscious minds. So with all the thinking and feeling we do for capoeira nearly everyday, how can some of it not follow when you enter the Sandman’s soporific realm? It’s daytime, and I’m in a line-up in the usual training room at the community centre I train at. It’s a long line-up that winds across the room to the door, and leads to a table at which my two teachers are sitting. People are lining up for…their apelidos. They arrive at the table, are given their nickname, it’s recorded on paper, and they leave. I finally reach the table, and am given my name: “Toca” or “Tugada” or something similiar-sounding. “What does that mean?” “Little Penguin.” [Note: I looked it up afterwards when I woke up and the words don’t match up at all…would’ve been amazing if they’d had!] I feel disappointed because I knew the person in line right in front of me had been named “Penguin” and I’d wanted my apelido to be unique. I dream that I’ve returned home from travelling, and bring with me friends I’ve made along the way. These friends are also capoeiristas, but from a different group than my own. We arrive just in time for my group’s batizado, and the first person we see is one of my regular teachers. He’s not too thrilled about the new capoeiristas, but quickly gets over it, and we all go to the public show our group is putting on. When the show starts, to my shock, one of my new capoeira friends has been put into the percussion band by someone. However, he keeps messing up…and I desperately want someone to replace him so the show can go on and because he’s making his own group look bad, but no one does. There is a big meeting with everyone in my capoeira group in the city, and it is announced that due to some sort of emergency, every teacher and every advanced student in the group must immediately fly to London, England, for an indefinite period of time. This leaves myself, a first-belt student, and another woman, also a first-belt student, in charge of our class at the community centre. I’m completely panicked, but one of my teachers who’s leaving says we’ll be fine. Those are the three capoeira dreams I remember most, though I’ve had many others! I hope you enjoyed that voyeuristic peek into my crazy subconscious mind. 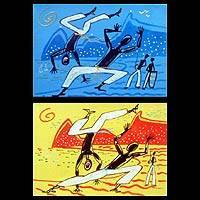 Have you ever dreamt about capoeira? Share with us in the Comments! I’m sure I’ve had capoeira dreams before, but the only one I can hazily remember is that I’m in the roda playing a vert fast ground game. This isn’t too unusual; I do most of my learning while asleep and prior to that dream we had been taught new ground combinations. I find that during class, if we get taught a move I cannot perform too well, I won’t stress if I haven’t ‘got it’ by the end of the sesh. I always find that after a good night’s sleep, I can usually miraculously start performing those moves drastically better. Sometimes dreams are just dreams. The three you have shared with us seem to be a little more than that though. Have you tried to decipher them for hidden meanings? those are interesting. I can’t really say I’ve had many dreams about playing capoeira. The closest dream I got was trying to break into some government facility to free a bunch of slaves in disguise(I count this as a capoeira dream because this happened after about 4 hours of talk by our mestre about being free and how to make slaves). I agree we should do analysis on these dreams. I can’t think of any dreams I’ve had that were exclusively about capoeira… But, in my dream last night, I was sent on a mission (by SHIELD, I saw Iron Man on Friday if anyone gets the reference) to go rescue some friends. The friends were being kept in some kind of cave by an African warlord (I had just watched Tomb Raider 2, terrible movie, but Africa was in it), and when I got there, there were these big gorilla (think Planet of the Apes) guards and I was spying on them and I remember clearly thinking “yes, they do capoeira!” so then I was able to go down and fight them. Yeah, I have some weird dreams. That’s actually really cool, Akira, I’ve never noticed before if sleeping on it helps me solidify how well I know movements or not. Cenoura…now that you mention it…I don’t think I’ve had any dreams in which I’ve actually played or done capoeira!! They were always to do with some other part of it, even if only the people! Lol. 1. I wanted an apelido (that dream happened before I got mine). 2. I had some sort of superiority complex regarding my capoeira group. 3. Attendance was dropping and fluctuating at that time in real life, so I was really worried about that. Faisca, that’s hilarious! And even more weirdly, your dream reminds me of one I had several years ago…it involved my friends disappearing from a hospital parking lot, and I found a mysterious GPS system on a seat in the hospital waiting room left there by a woman wearing a handkerchief and sunglasses, and the GPS system told me they were somewhere in Africa, and then later I discovered they’d been kidnapped by Celtic faeries! Wait, Cenoura, I just read over your comment again. How to “make slaves”?? You mean how to turn a group of people into slaves? Yeah, I don’t have dreams that involve playing capoeira that I can remember, but I definitely have the experience of closing my eyes to go asleep, and it’s like moves from class are playing on a screen on the inside of my eyelids . . . or my body feels like it’s still training even though I’m still in my bed! I did have a dream recently where I was trying not to reveal to some prying immigration officials that a brazilian friend of mine from capoeira was not a US citizen . . .
Joaninha-yeah, more in the understand psychological process that keep us trapped-like advertising, keeping up with the joneses than go to another continent, kidnap people, put them in chains and take them across the ocean for forced labor type of way. it was an intersting conversation, though. Cenoura, that sounds like it would’ve been a fascinating talk! So true, too…I would love to have been there to hear all of it. And it’s not too often you hear mestres talking about such issues so contemporarily like that (in my experience, at any rate). That’s hilarious, Shayna! It seems to perfectly symbolize for me a lot of the instances where students might disagree with or think something the mestre does/says/thinks doesn’t make sense, but they still go along with it or are forced to go along with it because s/he’s the mestre… 😛 And “free-form movement and creativity”, HAHA…classic!